Grouping files: directories or tags? A big difference between Subsonic 4.7 and MusicCabinet is how files are grouped into albums. Subsonic is mostly directory based. If you have a lot of files in one directory, they're seen as one "album". MusicCabinet, on the opposite, does not use a directory based approach. Instead, files are grouped based on tags. You can have multiple files from the same album in different directories (for example CD1 and CD2), and they're still grouped as one album by one artist. This, however, presents a problem for people who have badly tagged compilation albums (like "Summer Hits 2012"). Sometimes, there's just a bunch of files by different artists, placed in the same directory to indicate that they're one album. MusicCabinet will interpret these files as different albums, as they all have different artist names. To tell MusicCabinet that these files are all one album, you have to use the "Album Artist" tag (TPE2 in ID3 v2). By setting the "Album Artist" tag to "Various Artists" for all songs from the compilation album, it'll be seen as one album, and appear in the left frame as "Various Artists". 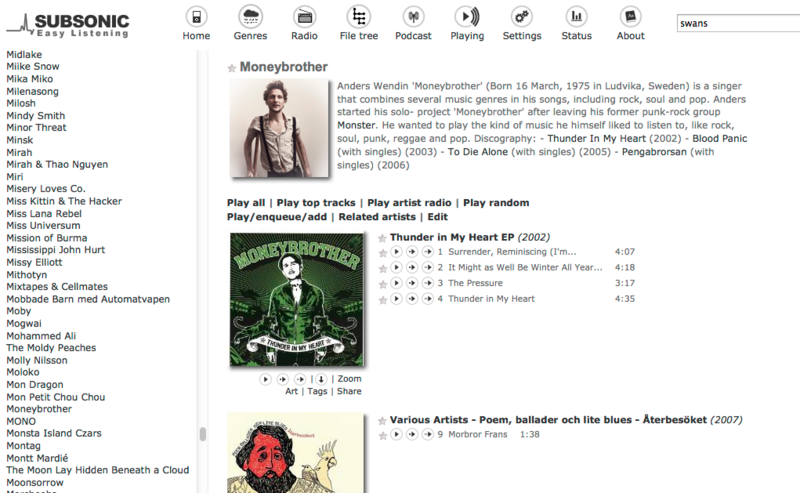 When the album is displayed, individual artist names per song are shown, scrobbled to last.fm, and can be searched for. The same goes for hip-hop albums where there's one main artist, but the single songs have different performers, like X feat Y, X feat Z, etc. To have such an album grouped as artist X in the left frame, set "Album Artist" tag to X for all songs. Only artists with full albums are shown in the left view, to avoid having it scattered with "one hit wonders". Just a tip for FLAC files: you have to use "ALBUMARTIST" and not "ALBUM ARTIST" if you manually edit files with tools like Mp3tag. foobar2000 automatically maps "Album Artist" to "ALBUMARTIST". Of course, you'll need to install id3v2 and flac packages. That would be great to have to possibility to edit these tag fields directly through the tag editor in subsonic. Sometime, I need to edit only two files or so, and it's kind of troublesome to edit them in cli. The "Various Artists" artist ends up being an important "artist" which is buried in with all the other artists under V. Would it be possible to make this a special case and stick it at the end of the alphabet letter links at the top of the left pane? Or perhaps make it a special link in the genre drop-down box under Artists? Ideally, the list of albums with the VA album artist tag would display in the left pane when clicked rather than loading in the main pane. Many people, myself included have almost as many various artist albums as single artist albums so I think they should be treated in a similar way, almost like toggling between Artist view and Various Artist view. Great mod by the way. Has made listening to music at work much simpler now I can just hit Artist Radio and enjoy tracks I haven't heard for ages. Thanks for all the effort you've put in. +1 I also have many various artist albums and would like to see a feature like this implemented. Keep up the good work! maxxh wrote: Just a tip for FLAC files: you have to use "ALBUMARTIST" and not "ALBUM ARTIST" if you manually edit files with tools like Mp3tag. foobar2000 automatically maps "Album Artist" to "ALBUMARTIST". Thanks for this heads up. The latest foobar2k version seemed to change this behavior somehow, the Album Artist tag is now mapped to TPE2 "ALBUM ARTIST" field instead of the previous "ALBUMARTIST". Is there any way to tune MC to read tag from both "ALBUMARTIST" and "ALBUM ARTIST"? It's too cumbersome having to remap the tag to maintain consistency. According to reference (3) from http://wiki.slimdevices.com/index.php/S ... portedTags, Foobar2000 and JR*Media Center uses ALBUM ARTIST instead of ALBUMARTIST. If there was a standard, I'd ask people to go for it, but since I can't find any official guidelines I guess it makes sense to fall back to reading ALBUM ARTIST after trying ALBUMARTIST.